The Qwuloolt project is a 370-acre wetland restoration project in Marysville, WA, along the Ebey Slough just outside of Everette, WA. 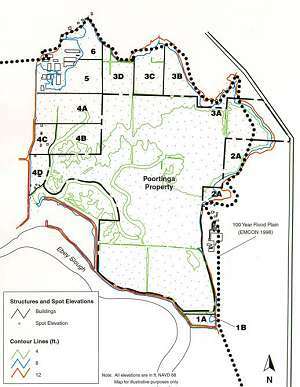 NOAA purchased the property for the purpose of restoration, using funding from litigation due to pollution of Ebey Slough from a landfill two miles west of the site 20 years ago. The property has been diked since the early 1900s. The intention is to remove the levees and flood the property, recreating wetland habitat and reinstating a functional marsh. However, the goal is to achieve this result without flooding the surrounding houses and commercial developments located on the periphery of the property. To accomplish this, significant modeling and evaluation have been conducted on the site and nearby reference sites. This is an interesting project because it highlights the importance of planning when a marsh restoration site is surrounded by developments. It also illustrates how tidal data are incorporated into hydraulic models. The U.S. Army Corps of Engineers published a comprehensive study of the project area in 2002, which includes a vegetation analysis, sediment analysis, hydraulic analysis, several options for levee breaches, and potential repercussions of each option. The most complicated aspect of breaching the levees is opening them enough so that water can move sufficiently in and out of the marsh to reestablish a functional habitat and natural hydrologic system without allowing flooding of the neighboring developments. Several options were examined. The levees currently surrounding the project area range in height from 6.5ft to 15.3ft. The location of the breach must be chosen carefully because of the hydraulic elements present within the marsh, such as two large tidal channels that extend through the site's interior. The ideal location for a breach in this marsh would utilize the conveyance provided by these channels to achieve a maximum hydraulic connection to far the reaches of the marsh surface. A tide gauge was in place at the Qwuloolt site for 16 months from November 2000 until March 2002. Tidal and geodetic datums were used to analyze the project. Using records from long-term NWLON (National Water Level Observation Network) station at Seattle, seasonal analyses and long-term sea-level trends were performed. Local mean high water and mean higher high water datums for Qwuloolt revealed that upon inundation, the marsh surface will become flooded above the 4-foot and 8-foot elevation contours at certain points in the normal tidal cycle. This puts the northwestern developments at risk of flooding. The estimated highest tide, based on a comparative study with Seattle, WA, is above the 12-foot elevation of the marsh surface, putting the developments on the eastern side of the property at risk of flood, in the case of an extreme tidal event. Frequency and duration of inundation analyses performed for both the short-term station at the marsh and the long-term station at Seattle, indicated that flooding at the site was a certainty. Nearly half of all high tides will flood the entire marsh surface, and it is likely to remain inundated for up to 18 hours at a time. If the levees are to be completely removed at this site, preventive measures will need to be put in place to protect the outlying developed areas. Any future planning must take this into consideration, as well as accretion rates associated with opening the tidal sloughs, salinity dynamics throughout the marsh, long-term sea-level rise, and long periods of inundation that may dictate the survival rate of potential plant species.